We’ve got lots to celebrate this month! 50,000 must be my lucky number because not only have I reached 50K words in my new manuscript (the third book in the dystopian thriller series ‘When Tomorrow Calls’) but I have officially had over 50K downloads of my books on Amazon. 50,000 downloads! When I set up my first indie title around this time in 2015 I would never have guessed this possible. I know I must sound like a stuck record but … THANK YOU! I couldn’t do it without you. 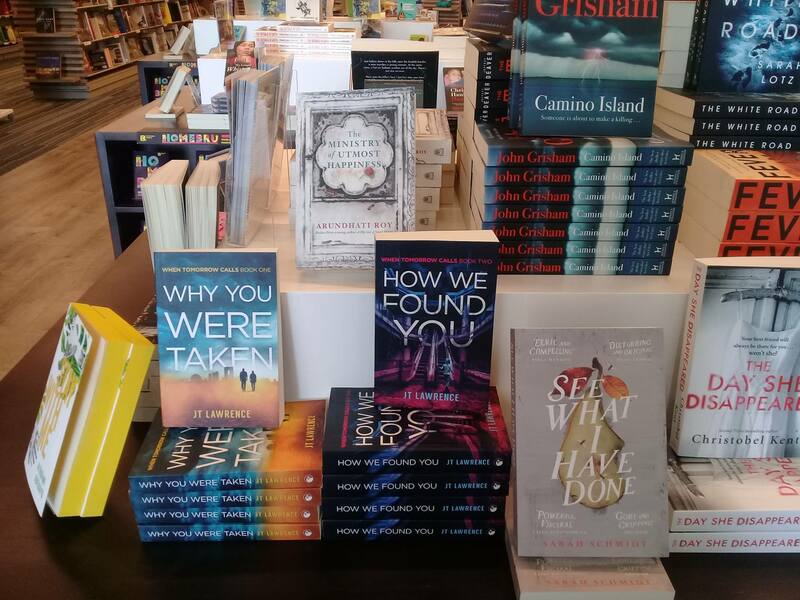 Also, thank you to Exclusive Books for their great placement of my latest release. Hey John Grisham! How you doin’? We’re making great progress and at least three of my audiobooks will be available by August. Last week I received the first 15-minute sample of ‘The Memory of Water’ from the producer and I just love Slade Harris’s new American accent. If you have time to listen to it I’d love to know what you think. If you have not yet read my disturbing short story ‘The Itch’ (part of the ‘Sticky Fingers’ collection) you can grab it here for free. I challenge you to read it and not scratch. Also free at the moment on Amazon is my funny short story ‘Travelling Slacks’about a TripAdvisor review that gets out of hand. I hope it makes you laugh! If you enjoy my futuristic thrillers you may also like ‘The Mockingbird Drive’ by A.C. Fuller, which has an outstanding rating on Amazon at 4.8 stars. It’s the third book in the series so you may want to pick up book 1 for 99c first, or the whole series for $10. Etisalat-award nominated Paula Marais is back with ‘Under the Surface’, an international mystery set against the backdrop of one of the world’s biggest natural catastrophes. Grab it today for only 99c. You can also score New York Times bestselling author E.E. Isherwood’s book ‘Sky Dancers’ at 99c for a limited time. As I write this it’s doing really well on Amazon’s Dystopian list … (I’m not envious at all!). That’s it for June. All the best and happy reading!